Your website footer is a really important aspect of your website but unfortunately it often goes overlooked (or ignored). And actually, your footer section should contain some of the most important parts of your website - your legal pages. Did you know that if you collect ANY information from your viewers (even just an email address), then you NEED to have some form of legal page? Well, let's dive into this subject a bit further so I can make it a little less confusing and give you some clear action steps today! 1. What is a footer? 2. Why do you need a footer? Your viewers often go here if they can't find something on your site. If your main navigation isn't working at the moment (sometimes that happens) or if they want to find a specific page, they will often look at the header navigation links (at the top of your page) and then go directly to your footer to look there. So people know what to do next. A good call to action to follow you, connect with you more, or sign up for your free offer (join your email list) is a good idea to help people engage beyond your website. 3. So what exactly should you put in your footer? Your legal pages. As I said above, there are certain legal pages that your website needs... and this will vary based on the type of business you provide, what you do with your website, and the information you collect. It's a good idea to have a quick chat with a lawyer about what specific items you need on your website. But don't skip this part! It could end in a headache down the road. Your site links. It's a good idea to provide all of your site links here so if someone is searching for something really specific they can find it quickly and easily. The number one frustration that will make your viewers run for the hills is a site that is hard to find what they are looking for. There are definitely more things you can add here... you want to look for things that make navigating your website easier and things that make engaging with you straightforward. 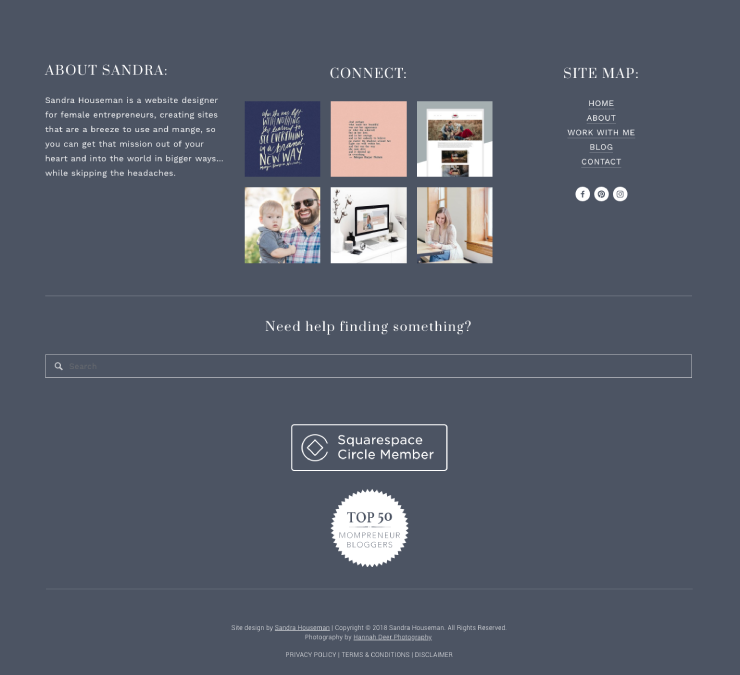 Want to see how I design a footer section in Squarespace? Ready for a website you love? Get a budget-friendly, easy-to-use Squarespace template and launch in no time.